I have been making this recipe for a number of years. It is always a delight. I recently made it for the first time since moving here to Hemet, using our outdoor gas grill. I usually form the basil-caper butter into balls and put it into the freezer rather than the refrigerator. That’s simply due to my not making it far enough ahead. 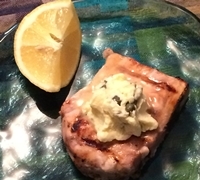 I try not to have swordfish too often because of the mercury issue, but it’s a good treat every once in a while as it’s a nice, firm, meaty fish. This is, however, also a very rich dish.